After spending all day at the polls, voters could begin to see midterm election results within hours. Preliminary results from the national exit poll are out, and the first polls begin to close at 6 p.m. ET. This year’s midterms are the first nationwide contests since 2016, when President Donald Trump was elected. Many, including the president himself, see this election as a referendum on his presidency. With Republicans currently in control of the White House and both chambers of Congress, 35 Senate seats, all 435 seats in the House and 36 governorships are on the ballot. The Election Day 2018 Live Map shows when polls close around the country and, as votes get counted, will give hourly state-by-state results for the Senate, House and governorships. 8:00 p.m. ET Polls are now closed in roughly half the country including these notable states: the rest of Florida, most of Kansas, most of Michigan, Mississippi, Missouri, the rest of New Hampshire, New Jersey, some counties in North Dakota, Pennsylvania and Tennessee. As noted, some states have extended polling hours. 7:53 p.m. ET — Democrat Jennifer Wexton wins Virginia’s 10th Congressional District, per ABC News projections. Wexton flipped the seat against Republican incumbent Barbara Comstock. Hillary Clinton carried the area by six points in 2016. 7:51 p.m. ET — Voting hours have been extended in some precincts in at least five states: Georgia, Illinois, Indiana, North Carolina and Texas. High-profile figures and candidates continue to tweet, asking voters to stay in line. Adding to the voices of Clinton and Gillum are Stacey Abrams, Lady Gaga and Beto O’Rourke. 7:39 p.m. ET — Greg Pence, the older brother of Vice President Mike Pence, has been elected to Indiana’s 6th Congressional District, per ABC News projections. The seat was represented by the vice president for more than 10 years before he became governor of the state. Pence is taking over the seat from Rep. Luke Messer, who sought the Republican nomination for U.S. Senate but lost the primary to Mike Braun. 7:35 p.m. ET — The polls are now closed in 9 states. At 7:30, polls closed in the closely watched states of Ohio, West Virginia and North Carolina. 7:19 p.m. ET — Hillary Clinton and Democrat Andrew Gillum, who could become Florida’s first African American governor, both tweeted to urge voters to stay in line because if they’re still waiting after the polls close, they can still cast a ballot. Remember, Georgia: If you’re in line when the polls close at 7pm, you can still cast a ballot—so stay in line and vote! While the GOP has been trying to make this election about anything but the future you want for your families, you are on the verge of making history. In Georgia, preliminary exit polls show turnout among nonwhites is a record 40 percent, including 30 percent black voters, in preliminary exit poll results. The previous high among nonwhites was 36 percent in 2014 – compared with just 18 percent in 1994. A voter wears a sticker that reads “I’m a Georgia Voter” at a polling station in Atlanta, Ga., Nov. 6, 2018. If elected, Stacey Abrams, the Democrat running for governor in the state, would be the first-ever African American woman to serve as governor in the U.S.
7:17 p.m. ET — Sources tell ABC News the president and first lady are joined tonight by his three eldest children along with son-in-law Jared Kushner, Kimberly Guilfoyle and daughter-in-law Lara Trump. The president’s 2020 campaign manager Brad Parscale, his first 2016 campaign manager Corey Lewandowski and deputy campaign manager Dave Bossie are there and also joining, longtime friends Tom Barrack and Richard LeFrak along with several mega donors close to the President. The president’s top White House advisors are also in attendance. 7:00 p.m. ET — Polls have closed in the first wave of closely watched states with competitive races: Indiana, Vermont, Virginia, Georgia, South Carolina and Kentucky. In Indiana, Democratic Sen. Joe Donnelly faces Republican challenger Mike Braun in a tight senate race, while in Georgia, Democrat Stacey Abrams faces Republican Brian Kemp for the governor’s seat. 5:59 p.m. 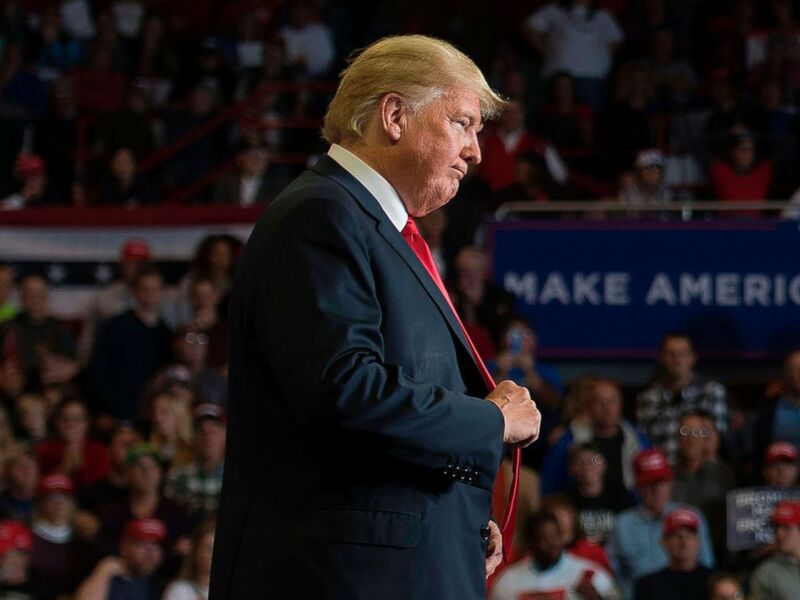 ET — President Donald Trump and which party controls Congress are front and center for voters this election year, according to preliminary results from the national exit poll. In results so far, 44 percent of voters approve of Trump’s job performance, while 55 percent disapprove. And while the House races will be fought district by district, voters by 53-43 percent say they’d rather see the Democrats than the Republicans in control of the House after this election. 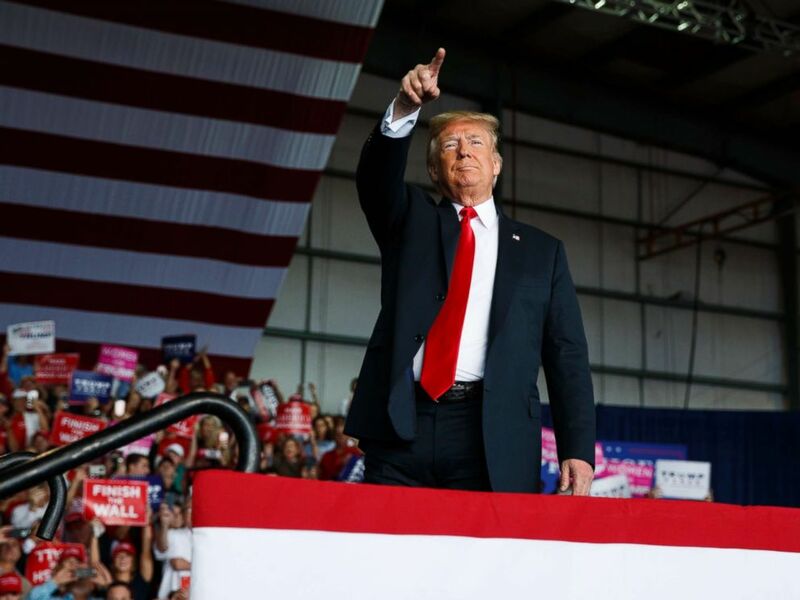 Read more here about why Trump has embraced the election as a referendum, and more here about the preliminary results from the national exit poll. 4:34 p.m. 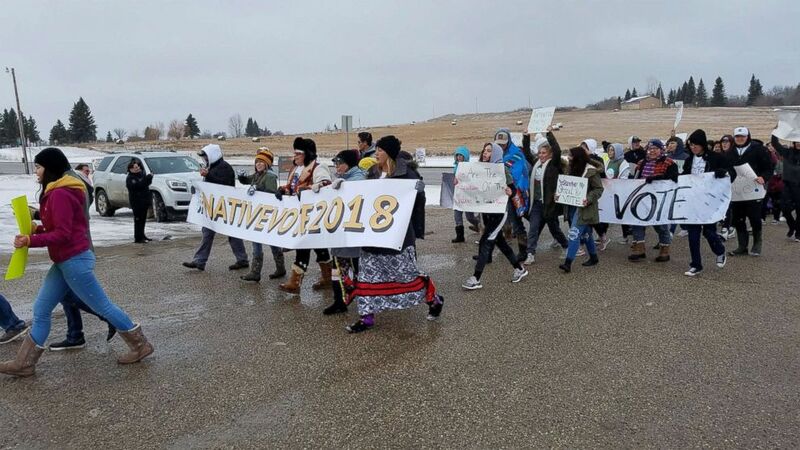 ET — Dozens of young Native Americans marched to their local polling place on a reservation near Belcourt, North Dakota. By the time they reached the polls, more than a thousand people had already cast ballots hours before the polls were to close. In comparison, just 950 people voted at the same polling site in 2016, according to an election official there. Tribal leaders have scrambled to print at least 3,500 new tribal IDs for Native Americans on reservations in North Dakota in response to the state’s new voter ID law, which requires North Dakotans to provide a state or tribal ID with a residential address in order to vote. Many Native Americans living in rural communities on or near reservations don’t have residential addresses. Native American youth from the Turtle Mountain band of the Chippewa marched from Belcourt High School to the Knights of Columbus polling place on the reservation near Belcourt, N.D., Nov. 6, 2018. 4:21 p.m. ET — The issues with electronic poll books in Indiana’s Johnson County have been “resolved,” election officials said. The midsize county, which is located south of Indianapolis, will not be extending voting hours but officials will add more voting machines if need be, according to Johnson County election board chairman Phil Barrow. Election Systems & Software, the electronic voting vendor the county employs, also confirmed in a statement that the issues were fixed. Johnson County is in a congressional district considered safe for Republicans, but the Senate race in Indiana is considered competitive, with Democratic incumbent Joe Donnelly trying to beat back a challenge by Republican Mike Braun. 3:41 p.m. ET — A 104-year-old woman cast her vote Tuesday. Margaret Norwood was alive at the time when women did not have the right to vote, according to a tweet from Muriel Bowser, who is running for re-election as mayor of Washington, D.C.
3:19 p.m. ET — Multiple high-ranking sources in the White House and outside advisers close to President Trump say they are bracing for an interesting evening – all the sources believe it is most likely the House will be in the hands of Democrats after tonight’s results. One source said the reality is if there is good news tonight for Republicans, the president will take all the credit; however, he already knows he will get blamed if it’s not a great night. President Donald Trump arrives to speak at a campaign rally, Nov. 4, 2018, in Macon, Ga.
2:27 p.m. ET — Outgoing Republican Rep. Darrell Issa of California, who did not run for re-election, predicted a Democrat would win his seat. Democrat Mike Levin and Republican Diane Harkey are vying to replace Issa, who has held the seat for eight terms. 1:56 p.m. ET — Los Angeles voters waiting in line at one polling station at least got serenaded by a mariachi band. 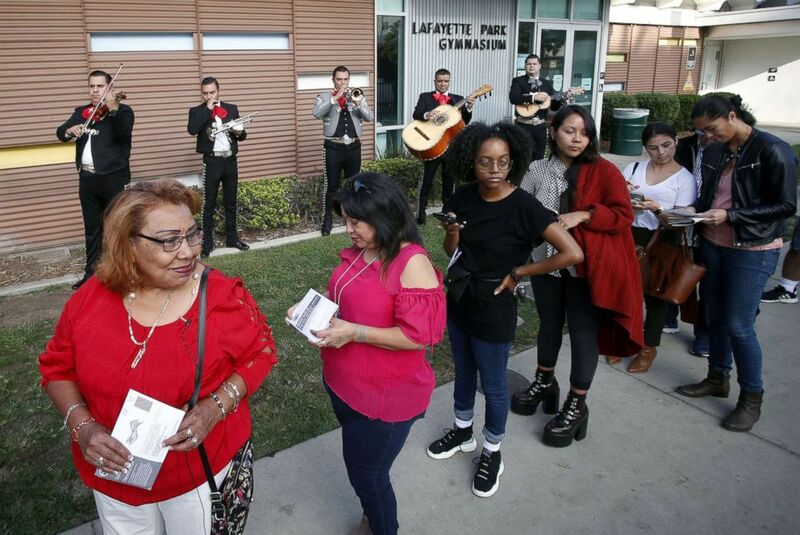 Latino voters Griselda Sanchez, left and Evelyn Franco, second from left, wait in line while being serenaded by mariachis at the Lafayette Park Gymnasium polling station in Los Angeles, Calif., Nov. 6, 2018. 1:49 p.m. ET — Federal authorities aren’t seeing anything out of the ordinary on election a Department of Homeland Security official said. There has been a typical scanning and probing of some election systems, but authorities haven’t seen an “uptick” in cyberactivity, the official told reporters Tuesday afternoon. 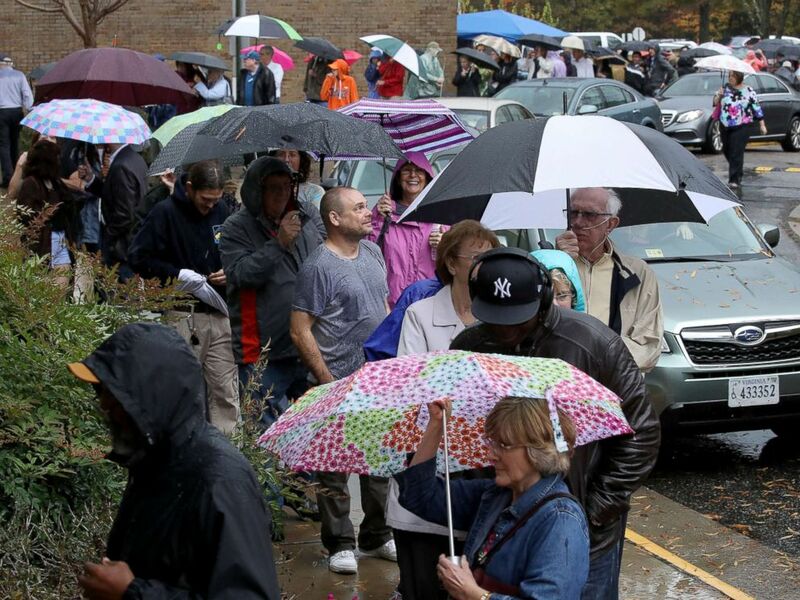 Virginia residents line up in the pouring rain to vote, Nov. 6, 2018 in Midlothian, Va.
1:00 p.m. ET — Polls are now open across all states, including Hawaii. 12:27 p.m. ET — Some Arizona voters will be treated to a cute, cuddly surprise at the polls. The Arizona Humane Society is bringing puppies to some polling sites around the Phoenix area to help lower blood pressure among voters and ease the strain of waiting in long lines. 11:59 a.m. ET — House Minority Leader Nancy Pelosi is confident Democrats will win control of that chamber of Congress in Tuesday’s election. President Donald Trump attends a Make America Great Again rally in Cape Girardeau, Mo., Nov. 5, 2018. 10:20 a.m. ET — Democrats in Florida voted prior to Election Day in slightly higher numbers than the state’s Republicans. More than 5.2 million Floridians in total cast ballots either by mail or early voting. Of that number, 2,110,782 were Democrats and 2,088,429 Republicans, according to newly-released data from the Florida Division of Elections. 10:03 a.m. ET — Newspapers across the U.S. splashed headlines conveying some of the emotion and tension around this election. 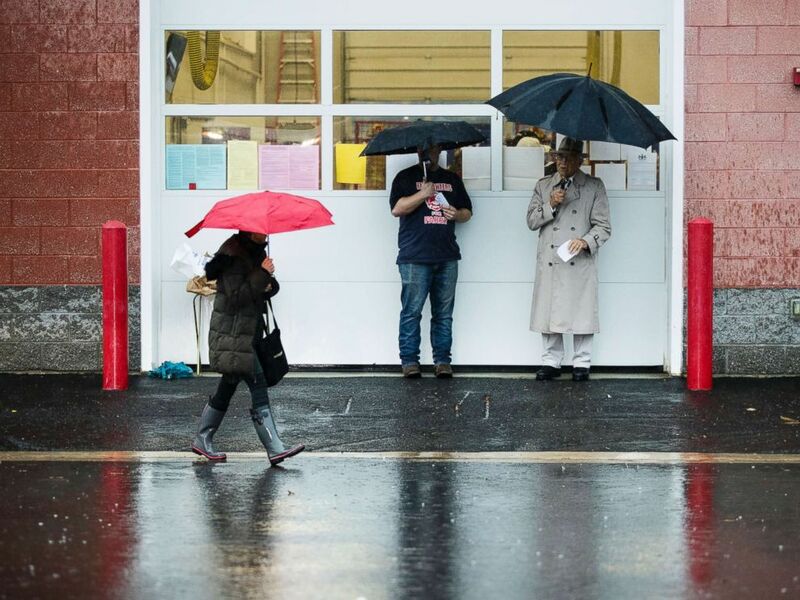 A voter walks in the rain from her polling place after voting in Langhorne, Pa., Nov. 6, 2018. 9:46 a.m. ET — Mark Salter, longtime aide and speechwriter for the late Sen. John McCain, a Republican, urged his Twitter followers to “vote for the Democrat (in most cases). McCain was one of Trump’s most outspoken Republican critics. The Arizona senator died in August at age 85 after a yearlong battle with brain cancer. 9:17 a.m. ET — Former Secretary of State Hillary Clinton, the Democratic candidate who ran against Trump in the 2016 presidential election, made a final appeal to voters. “For the past two years, we’ve watched this administration attack and undermine our democratic institutions and values. Today, we say enough,” Clinton wrote in a series of tweets. “But we won’t just vote against radicalism, bigotry, and corruption today. We’ll vote for fantastic candidates all over the country—including a historic number of women—who want to raise wages, fight for justice, and help more people get health care,” she tweeted. For the past two years, we’ve watched this administration attack and undermine our democratic institutions and values. Today, we say enough. 7:43 a.m. ET — Authorities in some states are warning voters to be vigilant about possible election problems. 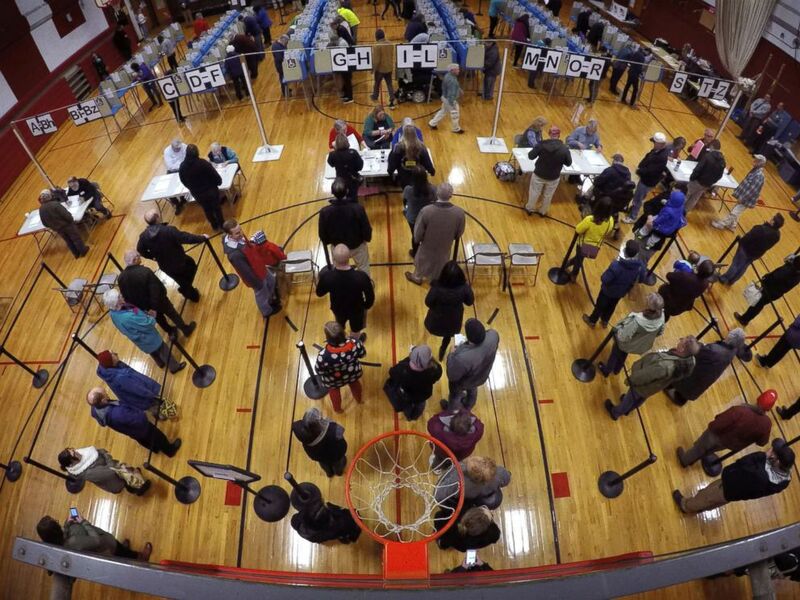 Voters wait in line in the gymnasium at Brunswick Junior High School to receive their ballots for the mid-term election, Nov. 6, 2018, in Brunswick, Maine. Get full election coverage on ABC News Live beginning today at 4:30 p.m. EST at ABCNews.com/Live, on the ABC News app and on Roku, Hulu and Facebook. ABC News’ Luke Barr, Chris Donovan, Katherine Faulders, James Hill, Jonathan Karl, Adam Kelsey, Meghan Keneally, Janice McDonald, Meridith McGraw, Victor Ordonez, Steve Osunsami, John Santucci and Scott Withers contributed to this report. Previous ArticleWould Republicans take another shot at Obamacare?